Knowing about ransomware protection tips are important to protect and secure the data on your computer, and this could avoid you from paying the ransom should your computer is infected with this malware. 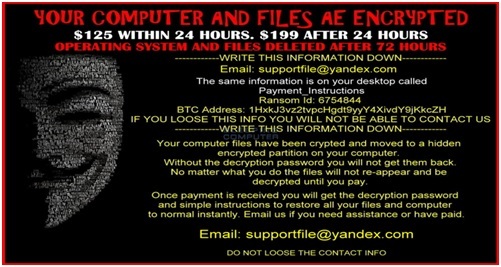 Ransomware is a type of nasty malware that encrypt your Windows system/files and prevent you from accessing to it once it’s infected until you pay the ransom accordingly. However there is no guarantee that you will get the access to your PC or files again after making the payment. Your computer can be easily infected with this ransomware when you click on the malicious link in an email. -Don’t fall prey to phishing attack via email that pretends to be sent from legitimate party or someone you know and entice you to click on the malicious link in email as this is very common way to infect your computer with ransomware. -Don’t only keep the important data on your computer or laptop, but you should back up those data through the external storage device or the cloud storage too (OneDrive, Dropbox, Box, Google Drive, etc). In this case you can go ahead to format your computer comfortably if it’s infected with ransomware later without paying any ransom but still able to recover the data. -Make sure your Windows operation system is up to date by using Windows Update so that to ensure those security bugs are patched timely. -You should also install antivirus and anti-spyware software with up-to-date signature to secure your computer. Don't forget to enable real-time protection feature in your antivirus or anti-spyware software. -Disable the macros in Microsoft Office documents (Words, PowerPoint, Excel, etc) unless you trust the source of the document and it’s been scanned with antivirus or antimalware program without problem. -Use non-admin account such as normal user or guest account to access the Windows system to minimize the infection risk. -Disable Java and Adobe plugins in web browser if possible as your computer can be compromised easily due to the vulnerabilities of those outdated plugins. Return to top of "Quick Ransomware Protection How to"! !